“Yes, you do! And you’re smiling, too!” the woman standing by her bicycle yelled back. Before today, I’ve run one other 10 mile race. That was the Broad Street Run back in 2008, and that was a good run for me that year. I ran it intelligently and tucked in under 10 minutes per mile pace at 1:39:39, just slowing down some in the final stretch because of some cramping issues. But today I took on the Icicle 10-miler which is held in Wilmington, DE every year in January. Now had they held this race this past Tuesday, it would have been a full Icicle 10-miler. Temps only got up to about 10 degrees that day and the wind was brutal. Today, low 40s or so, and some wind but not terrible, well except for some gusting issues on the northern part of the course and getting close to the turnaround point. I didn’t race it today. 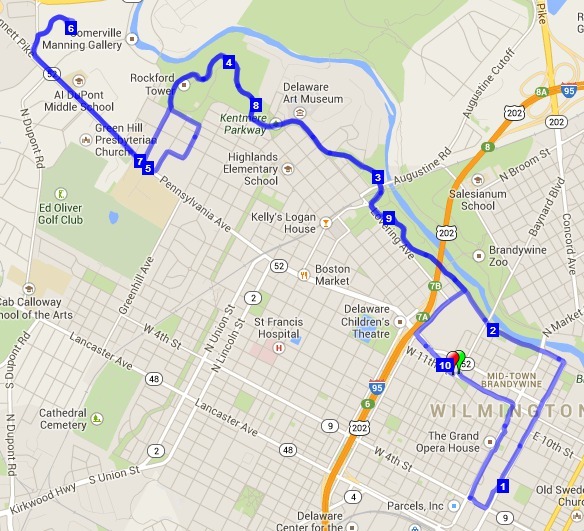 I just felt it would be fun to run the course and see some of Wilmington in this way and it would serve as a long run. I didn’t have the springiest feeling of legs either, they were on the tired side, and I also would have some blood sugar issues as it was 204 mg/dL before the race and after finishing found it had climbed to 277 mg/dL. I’ve generally observed that I don’t run as well when the blood sugar climbs over 180 mg/dL. The course was hilly. Surprising some considered how flat much of Delaware is, but alongside some of the rivers in the northern part of the state, you can get some pretty good rolling hills and this course has been laid out over some. So it was a much more difficult 10 miles than Broad Street, which is slightly net downhill and doesn’t really have any hills to challenge someone. In spite of those challenges, I had good spirits throughout the run and smiled a good chunk of times. Like the instance I wrote about first off, where the woman with the bicycle was cheering for a woman who was in front of me, telling her that she was looking awesome. I had a few minutes earlier pulled off my knit cap because I was warming up too much and I knew that there was an awful mess of hat hair on top. So it made me laugh and decided to yell out to ask if I was looking awesome. I didn’t realize I was smiling til the woman yelled back. Now that’s a smile, when it’s not forced, when it just happens, when it just happened because I was running and having fun and happy to be out there. I made jokes with some of the other course volunteers along the way, and reached the 5-mile marker in about 50:12. That’s when I figured with most of the way back being downhill it was time to work on closing strong so that’s why I did and I tried to take as much advantage as I could on the downhills. That extra effort yield a second 5 miles of 47:12 and my overall chip time was 1:38:03.9. Not bad for a mostly easy long run and only the third time that I have run 10 miles or more since resuming running back in August. And now I can say that I’ve done the Icicle 10-miler. In some ways though it was not nearly so icicly as the run I did do Tuesday night this past week. It was 8 or 9 degrees outside but it felt good to run after a 5-day break from running because of weather conditions. I did some cross-country skiing one day during that 5-day break, but it wasn’t as fun as running. I did have a walk break in the last mile. Probably a combination of going hard on the downhills and the blood sugar which had been north of 200 for the whole race, I hit that last tough uphill there and realized that I could probably go nearly as fast just by walking it. Around that time, some fellow who had finished probably much earlier, came jogging down the hill to exhort and help those of us in this final stretch. I smiled at him as I dropped into a walk, and he fell into a walk beside me too. Then as I neared the top, I said, “Time to go,” and I set to work on catching the 2 runners I could see in front of me before the final turn towards the finish. I caught the one fellow soon enough, but the woman in front of me had a fairly substantial lead and I just worked on finding what running legs I had left. We took that last slight left before the finish line and I finally did it, pulled past her with that burst which had gone on for about a quarter mile. As it turned out, she would edge me out by .6 seconds in the chip time standings. Still, it was fun to pretend that I was chasing a runner down in front of me and making that last glorious surge to a victory, however minor it might be. Wore the Xeros and toe socks today. So I didn’t collect any barefooting remarks. But that one stretch of the race where there were a lot of runners coming back from the turnaround point, I got a fair number of sideways looks down to my unusual footwear.